This large silver bowl profusely covered with gold niello work is decorated with typically Thai floral motifs, perhaps based on the chrysanthemum. The bowl is an excellent example of this type of work. The gilt-work is intact; there are no obvious losses. 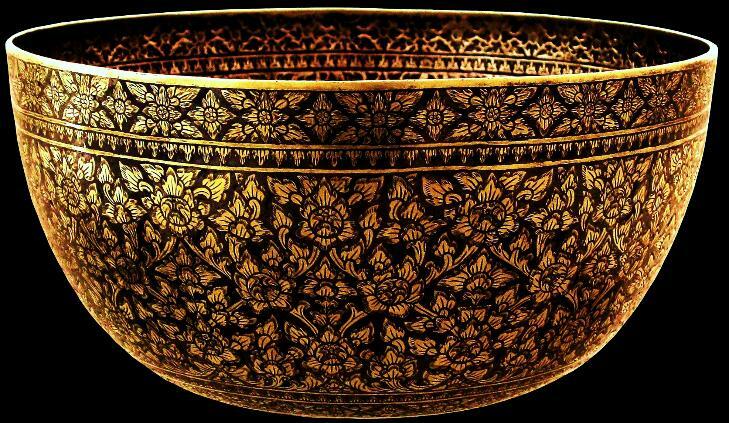 The bowl is a frequently encountered form in traditional Thai silverwork. The form is based on a Buddhist monk’s bowl, which is lower and wider than the Burmese counterpart. Niello is a process whereby designs are repoussed onto a silver object. The exterior recesses of the design are then brushed with borax and then filled with a metallic enamel which usually comprises copper, silver and sulphur heated together. The item is then heated so that the silver and the enamel fuse. After cooling, the surface is filed back and polished to reveal the silver surface. In the instance here, the exposed silver was then gilded.